The trend of liberating ourselves from traditional man-machine interfaces has, of course, also found resonance amongst music creatives. Stephan Vankov, a computer-based musician, felt restricted by conventional input devices such as keyboards and touchpads so he developed a hardware/software kit that turns any surface into an instrument. The Pulse Surface Controller consists of a piezo microphone and a software application. The mic can be attached to an object with a suction cup and connected to a computer's audio input. The software converts the acoustical impulses into MIDI data. The system turns a desk (or a laptop, or a tennis ball) into an instrument which can be controlled by finger tapping. The user can produce drumbeats and even melodies when combined with a Digital Audio Workstation like Cubase or Ableton Live. The awesome possibilities are demonstrated in the video below. The kit sells for $59 but is Mac only and shipping is limited to the USA -for now. An open source software alternative is Smacktop which turns Mac laptops into a drum kit. 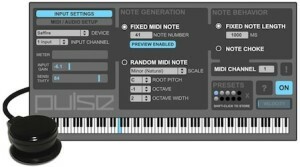 This utility translates the accelerometer (Sudden Motion Sensor) data into MIDI messages. This enables the user to control their favorite DAW by smacking their laptop.